← Blue bluebells and the digital debate…..
A visit to Skokholm island ……. and the joys of running a business. As mentioned earlier I spent a few days on the delightful island of Skokholm earlier this month. It is an excellent place to get close to razorbills and puffins, in particular, although the latter were conspicuous by their absence on this visit. Only during the first day – when it poured with rain – could they be seen standing conspicuously outside their burrows. And due to spring’s lateness this year, the vegetation was less colourful than I had hoped. But my visit has become more memorable for the presence there of another photographer – I’ll call him Greg. Soon after arriving we had a chat and he told me that, in addition to his full-time job, he was in the process of developing a sideline as a wildlife photographer. I told him I had earned a modest living from landscape photography for about twenty years, but more recently wildlife was becoming my favourite subject matter. I told him about my “Wild Wales” calendar. Back home a few days later I was browsing around ‘Talk Photography’ when I came across a post entitled “A trip to Skokholm Island”. I could hardly resist having a look, could I? And there were some landscape images of the island with the slogan “Wild Wales Photography” plastered across them. And yes, they were Greg’s. I immediately sent a personal message to him stating that I had been using “Wild Wales” in my business for many years, that I was in the process of registering it as a Trade Mark, and that it would be better for both of us if he stopped using it. During a short email conversation Greg told me that had bought “Wild Wales Photography” as a Limited Company about a year previously. It appears from the Companies House website that he actually registered it after returning from Skokholm this year, with the full knowledge that I was already using the name. He has also bought a “Wild Wales Photography” domain name. It must be genuinely confusing for newcomers because, on one hand, they can buy a domain name if it is available and immediately begin using it – no matter who else is already using one of the myriad variations on the same theme. On the other hand if the name also happens to be someone’s business name, they are getting into much more difficult waters. In my case I have been using it for over twenty years and steadily building up an awareness of the “brand”. This is the third time I have become involved in this kind of dispute. A year ago someone else living a few miles away from here also set themselves up as “Wild Wales Photography”, while three years ago another Jeremy Moore from Ceredigion also began trading as “Jeremy Moore Photography”! Unlikely but true…….! In both cases it was the availability of domain names that began the whole process – leading to problems and unpleasantness for both of us and considerable expense for me. I’ve had to register my own name as a Trade Mark – yes, it’s Jeremy Moore (TM)! Now where was I? Ah yes ……. Skokholm Island. It was a lovely few days, and I met some interesting people there. There was an exceptional print maker named Julia Manning; and Celia Smith, a sculptor who creates bird sculptures out of wire. It was good for me to talk to people whose interest in birds goes beyond counting and studying them – important though that is. And I found a pectoral sandpiper – a rare-ish American vagrant wader. In my opinion Skokholm is probably the best of the Welsh islands for bird photography. Skomer is great for a day visit but I’d describe Skokholm as “the connoisseur’s choice”. 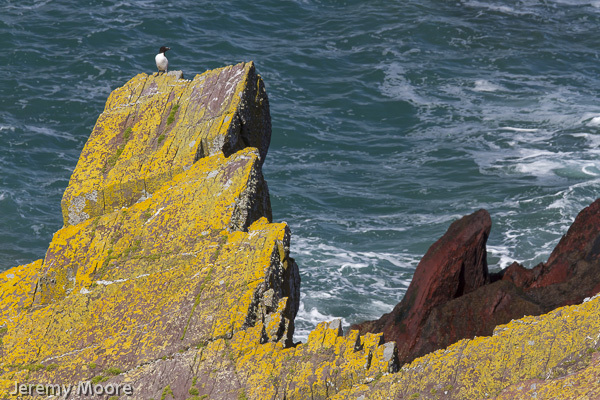 Not only are the birds just as close – or even closer – but the island itself is much more colourful thanks to the red sandstone rock that forms its coastline. And its relative inaccessibility is an advantage too. Postscript: Greg has generously (cough) agreed to let me carry on using “Wild Wales” in my business. This entry was posted in Uncategorized and tagged bird photography, business names, domain names, Skokholm island, wildlife photography. Bookmark the permalink.